It is impossible to ensure reliability and longevity of energy systems without controlling the quality of transformer oil. Recent experience shows that approximately 30% of transformer oil, filled in power transformers, has deteriorated to the point when it becomes a risk factor. This is caused both to natural degradation of oil in operation due to thermal oxidation aging, and contamination with moisture and solid particles. The traditional array of test methods is not quite enough to ensure timely action to prevent the need to replace the oil. The most reliable method of determining the cause for oil aging and selecting the most suitable purification technology is to run a complex test using modern instruments and oil control procedures. Such complex approach to oil quality also allows revealing defects of the equipment in early stages of development. At present, more advanced methods of oil testing are coming into use, such as highly efficient liquid and gas chromatography, automated particle counting and membrane filtration, infrared spectrometry, electric strength measurement etc. Electric strength of transformer oil is determined primarily by its purity. Breakdown voltage is significantly affected by dispersed water and solid particles, which conduct electricity. The adverse effects of moisture on oil operation have been studied well and wide. However, the effects of particles depending on their size, quantity and origin require further research. Such research is nearly impossible without application of modern oil contamination control systems and instruments. Solid particle content can be determined by the weight methods, which are, however, time consuming and difficult, but do not allow to determine particle size and origin. A much better solution is to use automated particle counters in combination with membrane filtration lab. This allows to control purity class, which describes the dispersed phase in the oil, as per ISO4406. Determination of the contamination amount in oil as per ISO4406 is a powerful diagnostic tool, which allows control of not only the purification system’s efficiency, but also presence development of various defects in the electrical equipment. This method is much more informative, precise and quick, compared to the usual weight method. 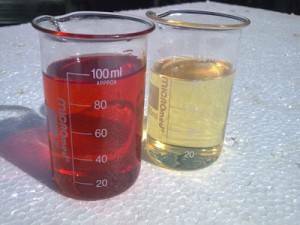 As a rule, transformer oils contain a large amount of particles smaller than 10 micron. These particles are very mobile and can drift and concentrate in areas of strong electric field. As a result, field becomes uneven and further degradation of oil insulation reliability follows. Metal particles, apart from reducing electric strength, also increase catalytic influence on the oil’s aging through heat and oxidation. Purity class control allows diagnosing the condition of oil impregnated cellulose insulation of the equipment during operation. High efficiency liquid chromatography is one of the most dynamically developing analytical methods today. It is used to determine the content of furan derivatives and additives in transformer oil, increasing diagnostic accuracy. Derivatives of the pentatomic heterocyclic compound furan, are selective products of thermochemical destruction and aging of cellulose, which is a component of the oil impregnated paper insulation. The content, dynamic of formation and ratio are the criteria of insulation condition. If more than 15 mg of furan compounds are detected in the oil of operating equipment, regular and extensive monitoring of insulation degradation is required. Furfurol content can also be determined by express analysis, based on color reaction of furfurol with acetic anhydride. Content of Ionol additive is determined by IR-spectrometry; a double-beam spectrometer (Perkin-Elmer 283, Specord M80) can be used. IR-spectrometry allows obtaining information on additives, aromatic and acidic compounds content, and can indicate the oil’s type if required. 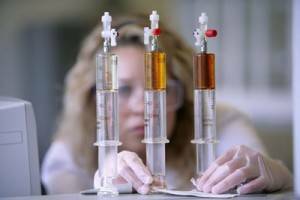 Using IR-spectrometry in combination with high efficiency liquid chromatography facilitates solution of nearly all analytical problems, related to the need of identifying various chemicals in the oil. This can be very important when diagnosing electrical equipment. Oil quality control can be improved in terms of efficiency and accuracy by determining the dependence of oil’s specific cubic conductance and tg delta on the oil’s temperature. Oil’s aging process results in increased content of polar compounds, acids and peroxides, water etc which leads to formation of colloid structures and sludge. Measuring volume resistivity of the oil, along with other electric tests, such as breakdown voltage and tg delta test increase efficiency of detecting hidden defects of a transformer or its bushings. The difference of volume resistivity between heating and cooling of the oil is common when colloid compounds are present in the oil. Implementation of chromatography labs for DGA increases accuracy of diagnostics and makes the analysis simpler and more efficient. An example of accuracy and extent of the above methods: a transformer was diagnosed in 1997; the process included a full scale physical and chemical analysis of the oil from the transformer’s tank and bushings. DGA indicated CO, CO2 and CH4 exceeding the limits, which is a sign of thermal defects of solid insulation. The high content of furan compounds and their distribution in the oil tank is indicative of paper insulation destruction and local thermal defect. Very large particles of glassine and varnish also indicated destruction of paper insulation and varnish cover of lamination stack. Diagnostics of another transformer the same year also yielded extensive results. DGA indicated that oil had been heated to 622C; no defect of the cooling system could have caused such temperatures. A thermographic test showed a possible steel burn-through in the lower portion of the magnetic system between phases A and B. A significant amount of metal particles was detected by membrane filtration. A closer look at phase B showed, that the bushing’s condition was unsatisfactory. 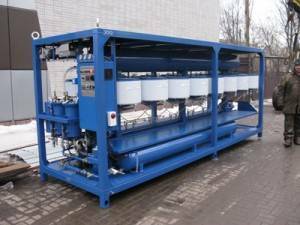 The oil was nearing the limit of contamination content; the membrane filtration method showed presence of regular spherical metal particles in the oil; such particles can only be formed by electric discharge or arc. Tg delta was unacceptably high (20%), besides, an abnormal change of Tg delta with temperature was detected (tan delta was 0.5/2.2/20% at 20/70/900C respectively). The conclusion of the diagnostic was that the oil aging was accelerated and colloid conglomerates were being formed. Phase B bushing had to be replaced.